Starring Jessica Lange, Elizabeth Shue, Bob Hoskins, Hugh Laurie, Aden Young, Kelly Macdonald, and Geraldine Chaplin. Most costume dramas about a poor relation follow a similar trail: The poor one, filled with high expectations and good intentions, gets the money and true love by suffering through a series of pitfalls, only to be winking at the audience by the ending credits. Our Cousin Bette gets there, but she chooses another road, perhaps more hazardous, but infinitely more entertaining for us. This fascinating tale is about a relative who is treated poorly by everyone in her aristocratic family, while they themselves live in debt, denial, and high fashion. Jessica Lange plays the title character with a cynical smirk, as though she’s daring every one to call her out, yet she knows – only too well - that people are so consumed by their own personal dramas that they ignore the fine details. Described as “the bad seed who refused to blossom”, Bette is the sister of Adeline, who languidly takes her time dying, while instructing her spinster sibling as to what flowers to lay on her casket. One look at the two – Adeline in her death-bed finery and Bette, in a basic drab dress, devoid of any adornment – and it’s all too evident where the balance of power resides. Describing herself as a “country peasant”, Bette lives in the slums of Paris, working as a costume seamstress to the reigning burlesque star of the day, Jenny Cadine (played by Elizabeth Shue), who vainly shows off her derriere before every final curtain is rung down. Jenny puts off the ticking clock of time by enjoying the attentions of her many rich – and generous - admirers, yet one fateful day an encounter signals her worst nightmare. ‘Carabine? Is that you?’, I asked. ‘No, there is no Carabine, she has left me.’ "
Originally a novel by French author, Honore de Balzac, this modern version boasts an international cast of talent: Bob Hoskins (Cesar Crevel), Hugh Laurie (Baron Hector Hulot), Aden Young (Wenceslas), Kelly Macdonald (Hortense Hulot), and Geraldine Chaplin (Adeline Hulot) all twist and turn in time to Bette’s song of vengeance. Set in Paris, during the pre-revolutionary period of 1846, screenwriters Seifert and Tarr turn Balzac’s morality tale into a microcosm of the class resentments barely simmering just beneath the pearls and petticoats of Bette’s shadow world. Yet she’s nothing if not flexible, as she revises her best-laid plans in the face of cross and double-cross by family and high society associates alike. Surrounded by people with their own notions of power, Bette plays nonstop Powernoply until she wins all, while the French Revolution rages. 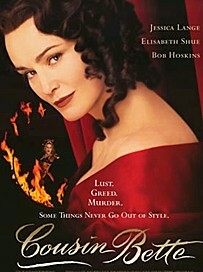 She’s able to play upon the passions of her tormentors and deftly manages to wreck her subtle brand of ruthless revenge upon one and all; causing adultery, a duel, physical illness, embezzlement, financial ruin, imprisonment in the Bastille, and a crime of passion - all of which sees her contentedly sewing in the grand house, dressed in her own silken finery, cooing to a child who’s the product of this genteel carnage. * This review first appeared in Outside Hollywoodland, November 2009.